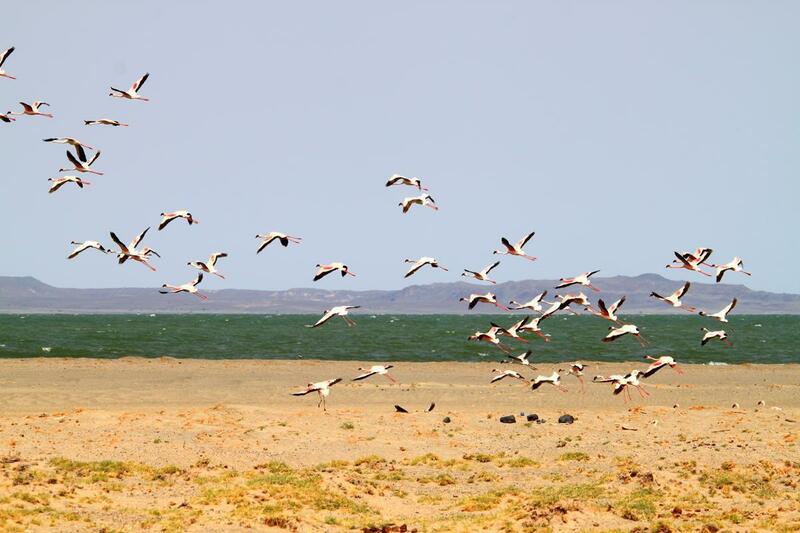 We had heard of the beauty of Lake Turkana but were still taken by surprise with the stark isolation of ‘The Jade Sea’. 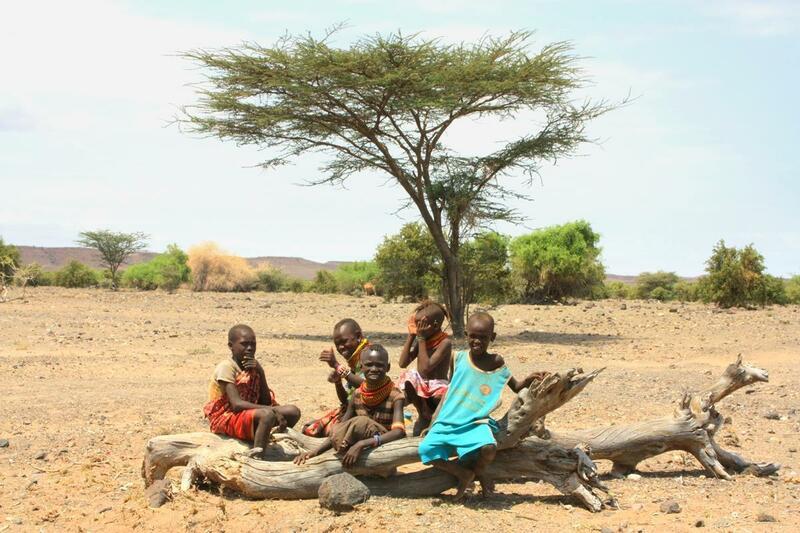 From Maralal we headed north for Lake Turkana, stopping by at World’s End Viewpoint, managed by the Malsasso Community. Even though it was not a clear morning the view was still awe-inspiring. The view at World’s End View is awe-inspiring. 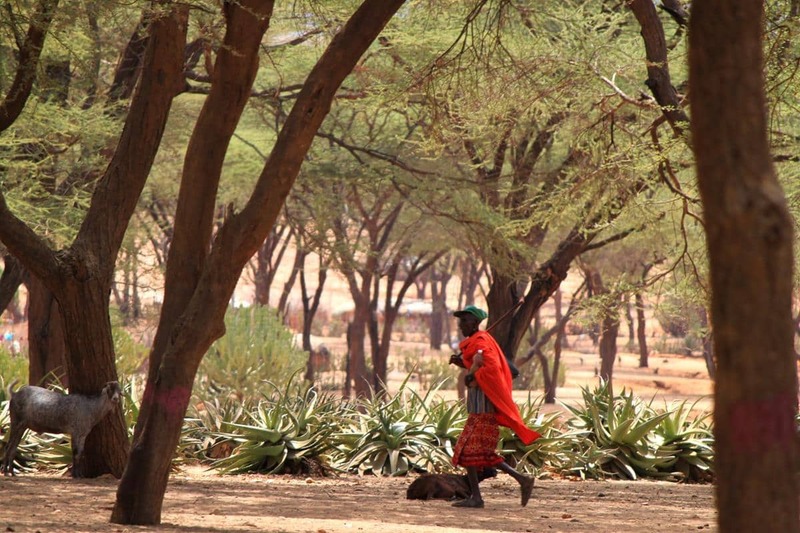 Later we stopped for coffee under the sparse shade of an Acacia and in no time we saw herders trotting their livestock down the hill toward us. 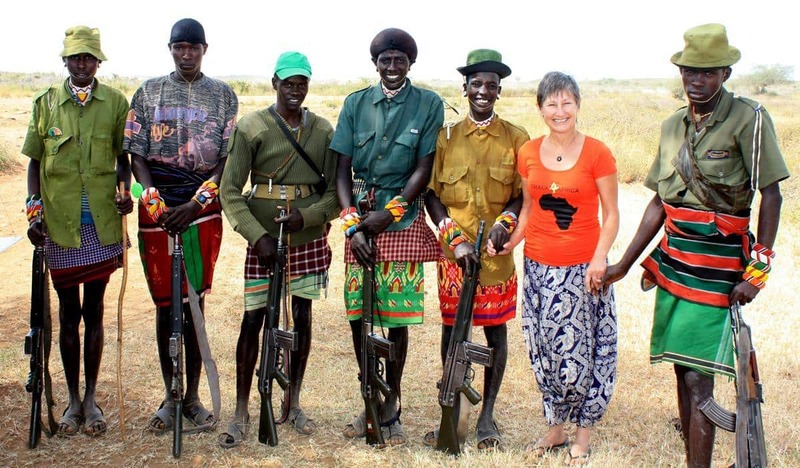 As they neared we noticed that they were all armed with well-worn AK47s or FN 7.62 automatic rifles with ammunition belts, reminding us that there is considerable conflict in this region between the Sambura and Turkana tribes. 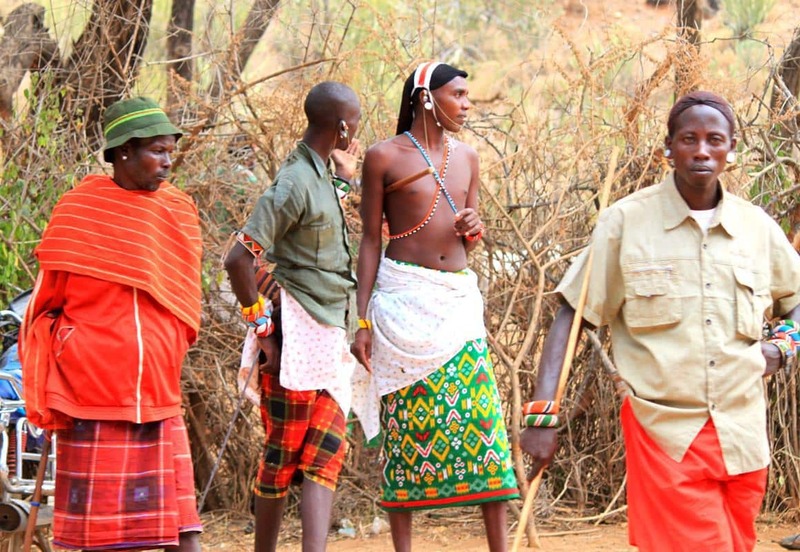 These fine featured, cheerful, boisterous young men were Sambura in traditional clothing with headgear. The only one who could speak English informed us that their weapons are used to protect their livestock from theft. I was pleasantly surprised when both men on either side of me spontaneously took my hands for the photo. Passing through South Horr we first saw the domed, round huts of the Turkana people, even though this was still very much Samburu country. 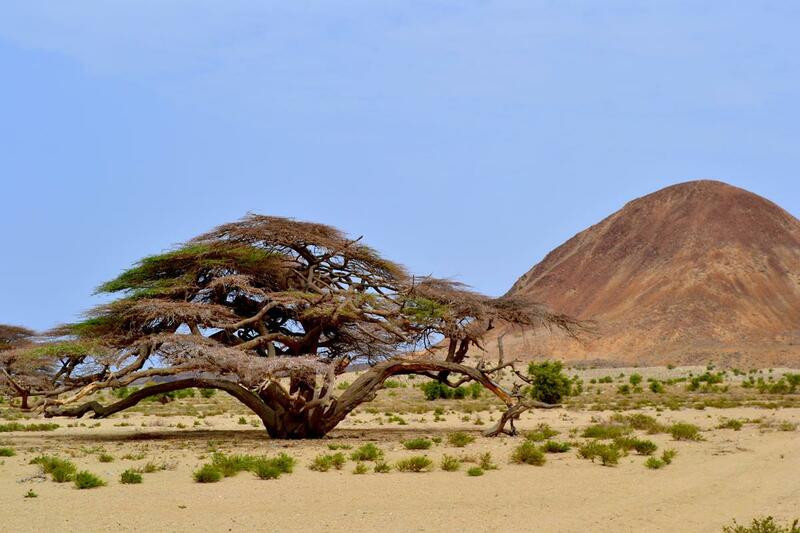 We were delighted by this interesting settlement set in a landscape of a series of wide, dry Acacia shaded sandy riverbeds. 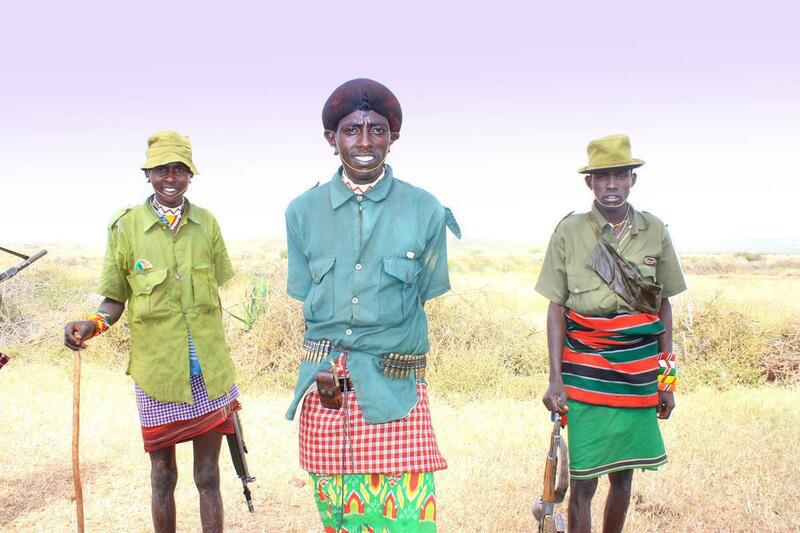 Samburu people in South Horr. As one reaches the lake the rolling hills are covered with black volcanic rock and the first 10 to 15 km of road consists of a jumble of very rough, sharp rocks which took us about an hour, crawling along to nurse a still leaking, plugged rear tyre. The isolation and these conditions brought to mind several warnings to carry a second spare. The arid eastern area around Kenya’s largest lake is desolate but the hues of black, green and yellow contrast with the warm, jade tinted water. 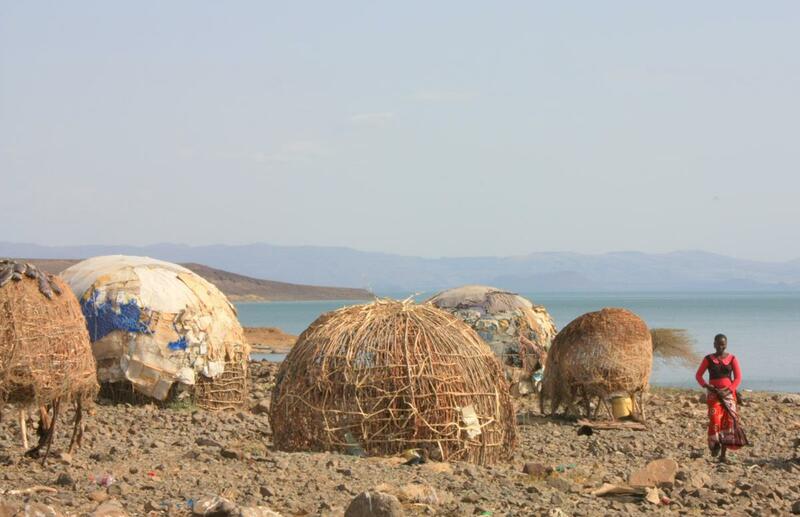 It’s hard to believe that the Turkana herders survive in these harsh conditions, living in round, low, domed, shelters built from saplings with a reed or patchy plastic covering, we imagine to protect them largely from the strong diurnal winds. 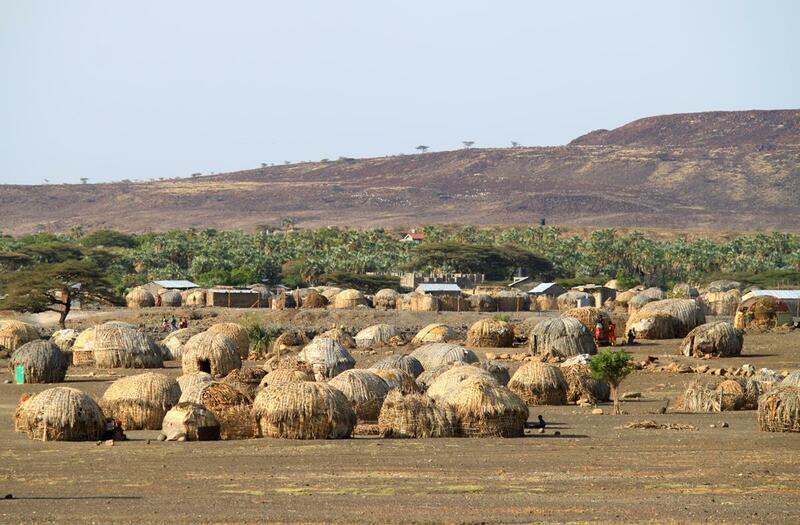 The Turkana people live in domed shelters. 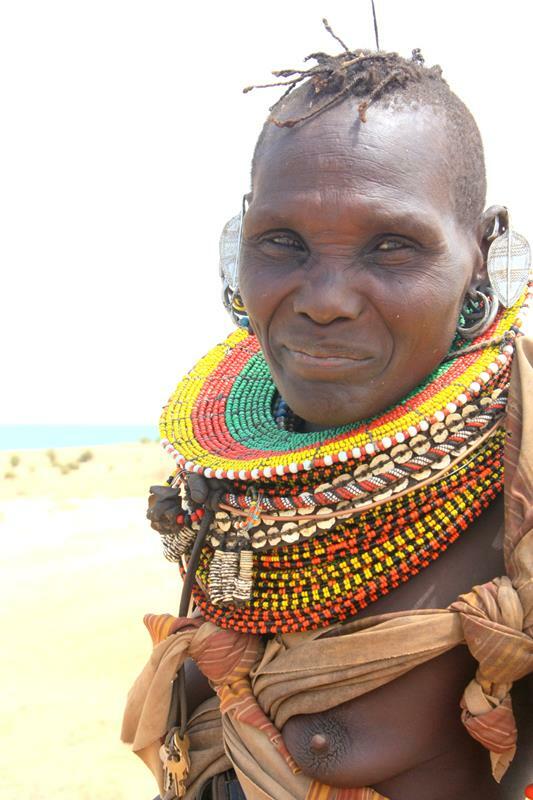 Most of them still wear traditional dress, the women being the most colourful in their bright beaded necklaces and earrings. 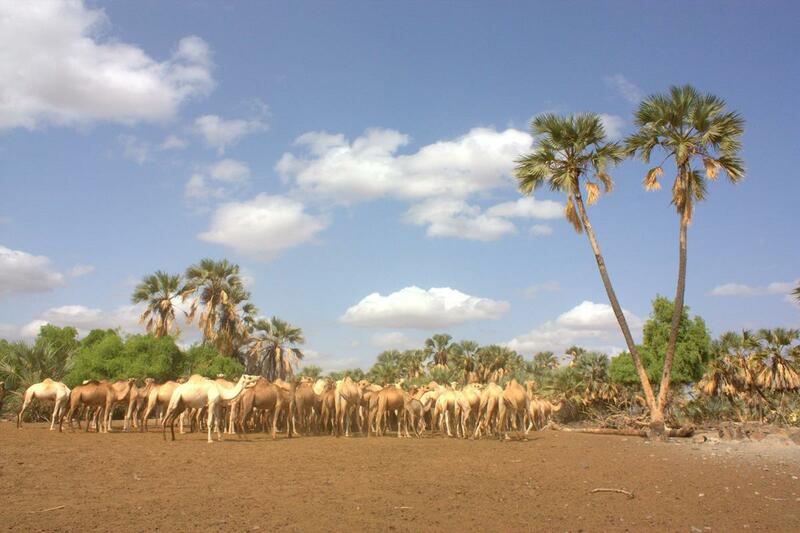 Their livelihood depends on their animals – goats, sheep, donkeys and camels – and here in virtual desert we have seen the biggest herds of livestock of anywhere in Kenya. As no cultivation is evident it’s a mystery how these people survive on only meat, milk and blood drawn from the animals. We arrived at Loiyangalani late in the afternoon and were once again reminded not to form expectations from what we may have read. Loiyangalani is situated at an oasis. The village was not unexpectedly a dust bowl and as the first campsite was run down and derelict, we settled on Palm Shade Resort, nicely equipped at one sixth of the former’s asking price. As the sun set the lake breeze picked up and developed into an almost howling gale. Luckily we were sheltered by cabins and trees, but we had the worst night of the trip as the wind dislodged the steel struts from our roof top tent and we feared that the tent might get damaged. We were up at first light, the wind dropping only as we breakfasted and packed up. There were two choices north to the Ethiopian border; we took what we thought would be a more scenic route along the lake shore rather than the road further to the east. This took us through even more isolated country, initially around smooth, sweeping turns scattered with rocky sections. 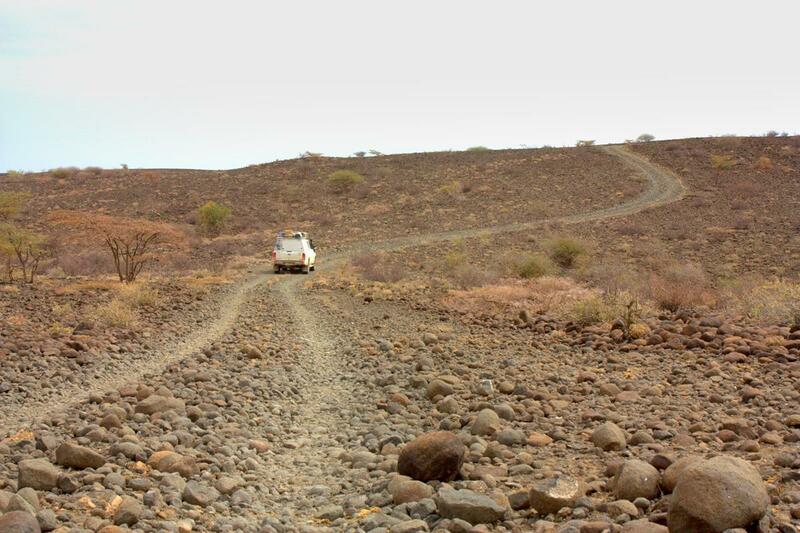 Rocky roads around Lake Turkana. At times small rises would offer us beautiful views of the lake and at one point, a flock of flamingos feeding in a pool. 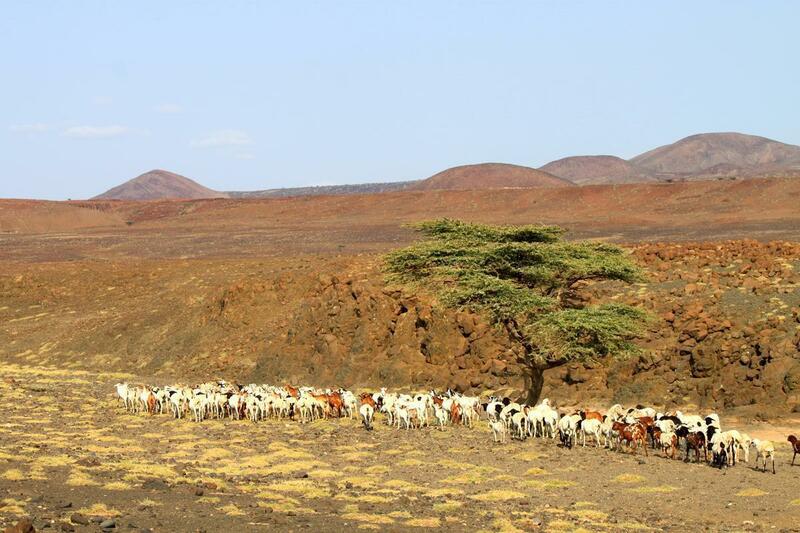 At first there was plenty of livestock but as we headed north, it became more arid. The road gradually deteriorated with many hummocks, small stream channels only about 50m apart requiring a gear change down to first, as well as wide sandy river beds. The almost 100km was a full day’s driving! Towards 4pm we reached an uninspiring bush camp site marked on the GPS, so instead found a wide riverbed and reached a superb spot about 1,2km downstream, to be undisturbed by anyone. 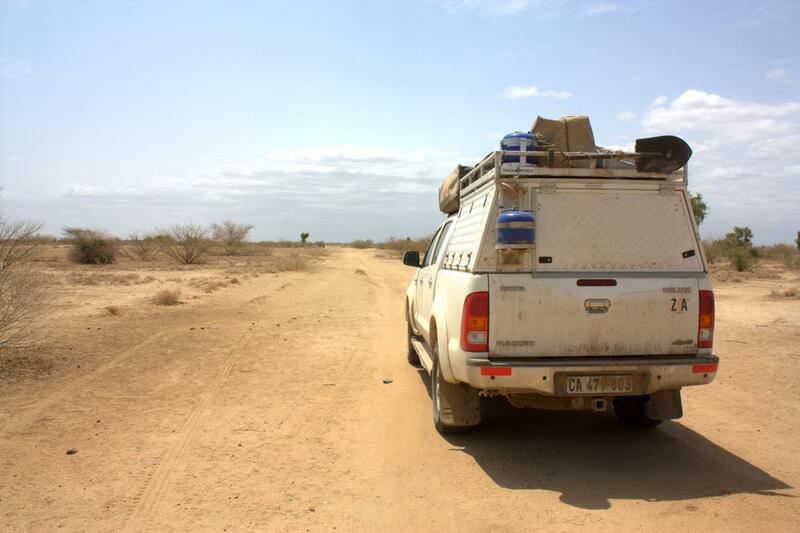 It was another interesting day’s drive but we were reminded of the importance of a reliable vehicle as we hadn’t encountered another traveller the whole day that it took us to cover the distance. After a warm, idyllic evening next to the fire we had another windy, noisy night in the rooftop tent which persuaded us of the wisdom of bringing (and using) a ground tent. Bush camping in a dry riverbed under a huge Acacia tree. The next morning we lingered a bit in the cool of our big Acacia tree rather than arriving early at our night stop with the temperature still well above 30 degrees Celsius. Our route swung east and away from the lake as we wanted to avoid Sibiloi National Park following several luke warm reports we had received. After the very bad road the previous day it was difficult to imagine that our route could remain that bad for another whole day, but that proved to be so. 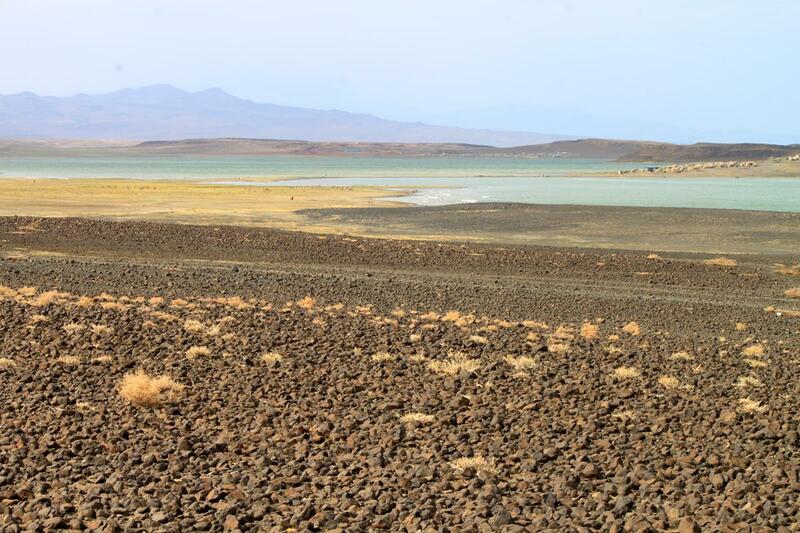 We also began to realise the size of Lake Turkana, having allocated four days to drive its length; the distance of which is exaggerated by an average speed of less than 20 kph. Today’s drive took us seven hours to cover 100 km. The journey was anything but tedious as the road wound its way through terrain which varied continually from hills blanketed with black volcanic boulders to flat plains covered with scrub and a short stretch that was just desert. We would often see a herd of goat or camels, and sometimes donkeys, in the distance, knowing that there would be the obligatory herder present. A herder with his camels. 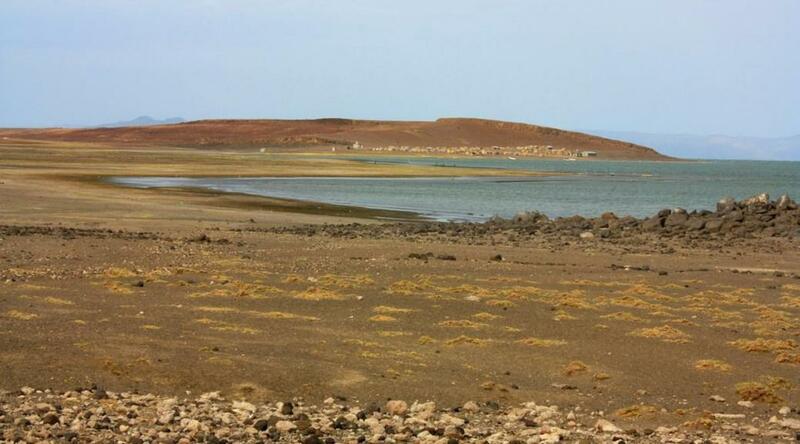 Interesting landscape around Lake Turkana. Whenever we stopped for coffee or lunch, or to plug the leaking back tyre, it wasn’t long before people would approach us and marvel at our setup. Very few of them could speak English, but once or twice women indicated that we could take pictures of them in return for Shilling, the local currency. Curious kids looking at us during our coffee stop. The landscape reminded us of both of the South African Richtersveld and Karoo, the main difference being the occasional palm oases that honoured the otherwise dry landscape with an insinuation of water in some dry riverbeds. As the GPS indicated ‘Drinking Water Well’ at Derate, we hoped to fill our jerry can for our basin ‘bath’ that evening. As we neared we saw a big, palm fringed oasis. However, there were a few large herds of goat and camel before us in the queue! It was another fascinating day’s drive with only one vehicle passing us the whole day. 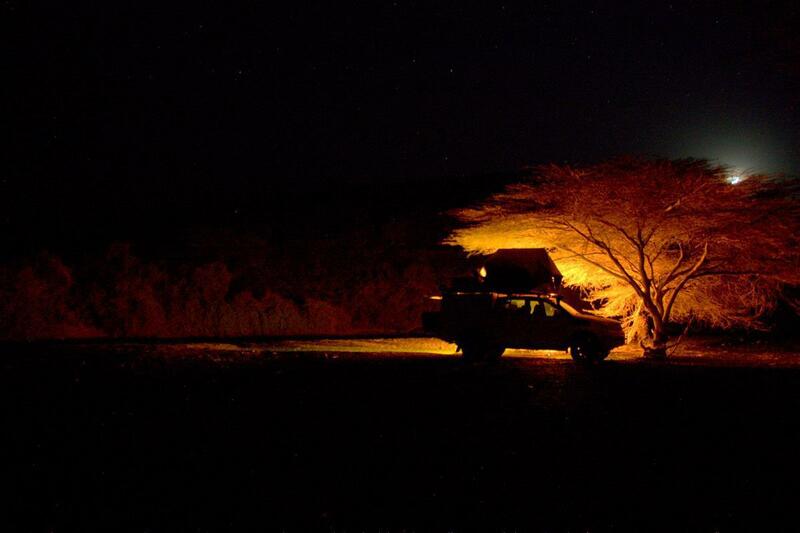 The bush camping site on the GPS was again uninteresting and several large herds of goats nearby encouraged us to drive on until we found a quiet spot under an Acacia tree. Our hopes that we would be sheltered from the wind by the surrounding bush proved false and we once again had a disturbed night, due to our reluctance to erect the ground tent after the long day. 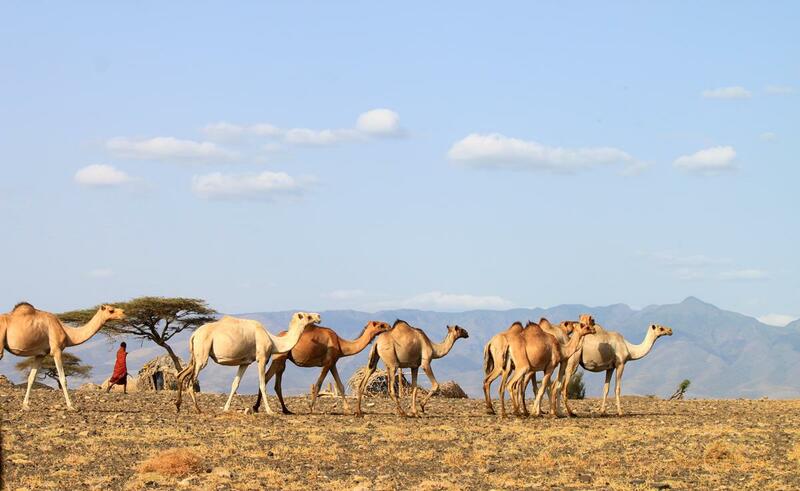 We have seen the biggest herds of livestock around Lake Turkana than anywhere in Kenya. The fourth day’s drive was in landscape and road conditions much as before and when we reached the anticipated bush camp spot at the north of the lake around noon we decided to push on. It would inevitably be very windy again from the late afternoon and in the meantime there was no shelter against the blazing sun. Passing through Illeret we found both cell phone signal and shade under an Acacia tree in front of what turned out to be the police station. This was a mistake! We had been warned by fellow travellers not to report at this station as the chief finds gratification in demonstrating his power by giving travellers a hard time for passing through a ‘proposed’ border post. Fortunately we had the business card of an Assistant Director of Immigration Services of Kenya who had authorised our exit in Eldoret. In spite of this the police chief exercised his power and position for at least half an hour before he let us go with a warning only to re-enter Kenya via a fully established border crossing. By then we were looking forward to a shower and a good night’s rest and were excited with the prospects of a new country. Crossing the border between Kenya and Ethiopia without any official signs. My geography is improving every day from your blogs, keep up the good work. The tax work is suffering though!! 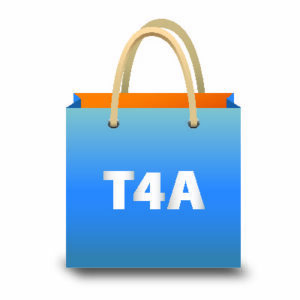 HI Karen (of similar great nameness) – absolutely loving your blog. We did a similar route in 2011 with a similar car too. I remember it like yesterday! Thank you so much. 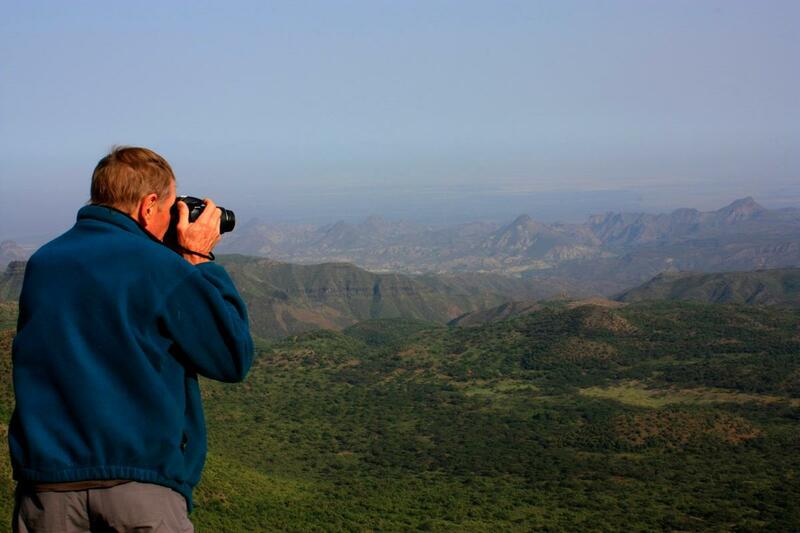 Looking forward to hearing your Ethiopia experiences. Loving it all. Still on my bucket list (I fear the bucket might have a hole in it) Be safe ! !